Download the inventory file and save it in your local folder. 3) the map, where design of the experiment automatically emerges as actions are carried out at the bench. 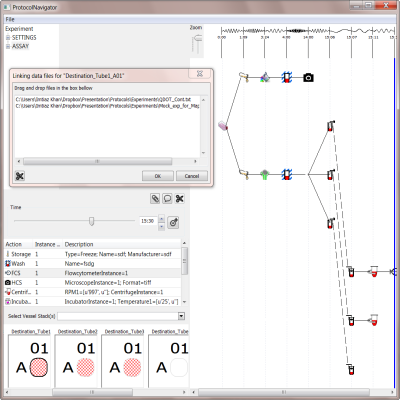 This interactive map depicts both the experimental design (as the spatiotemporally linked patterns of actions), and the provenance trail (linking manipulations and measurements). Interfacing with the map, experimentalists can derive knowledge through navigation, interpretation, and assessment. Importantly, the map can be shared with collaborators and produced in a textual or indeed a narrative form as part of a publication. 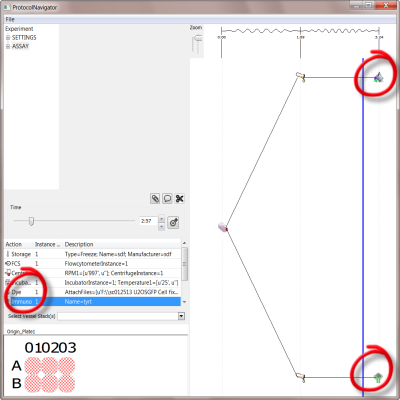 The panels/windows can be resized by selecting the corner or divider line and mouse dragging. Note It is appropriate to think of ProtocolNavigator as a design board - above and beyond Laboratory Information Management System (LIMS). Because it enables user to design the whole or part of the experiment during the brainstorming session, which usually happens long before the real experiment is carried out. This design can be done from the scratch or incorporating and modifying parts of other's design. During experimentation, drifts that occurs from the design can be easily modified and incorporated, thus the design now reflects a practice map. Indeed all experiment related information are embedded within the map akin to LIMS. 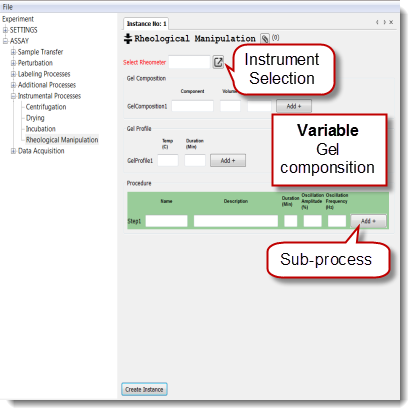 Moreover saved components or the entire experiment can be reused in the future by others. 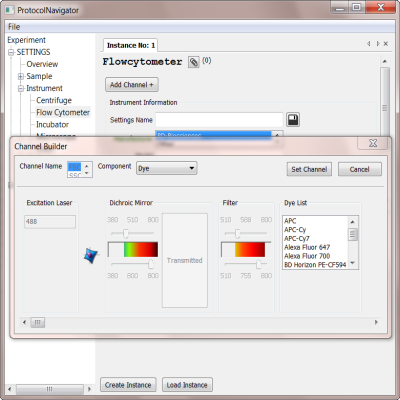 This provides the capacity for prototocol exchange, adaptation, comparison and accuracy. How to do bench work? 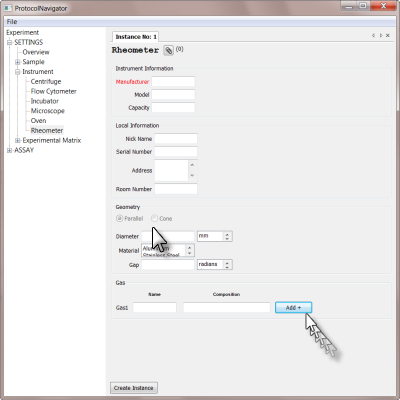 In ProtocolNavigator, the virtual Bench mimics a typical laboratory workbench, where experimentalists/users emulate their real life laboratory practice through this 'Bench' panel. Akin to reality, a given experiment consists of a set of manipulation and measurement activities that are synchronized with time. 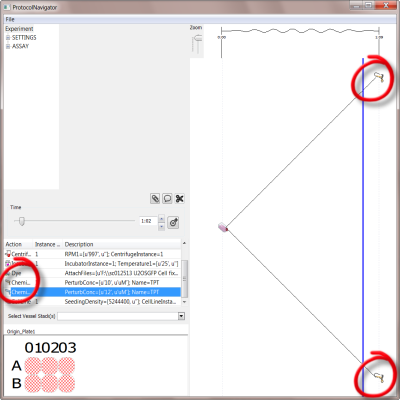 To start with, at this virtual bench, the user has a 'shelf' of all the elements (reagents and instruments) required for the manipulation/measurement activities. 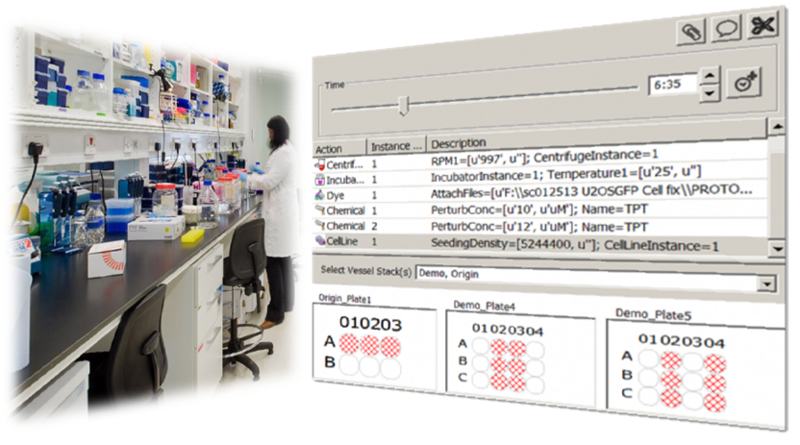 Multiple instances (capturing the variability of drug/dose, settings aspect) of these reagents and instruments created via the Inventory panel are available in this shelf. The workbench also contains the experimental vessels (e.g., plates and wells) to which instances of reagents or instruments can be applied at given time points. 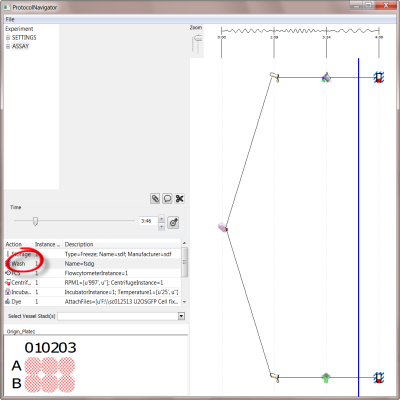 A time slider is also included for time point selection. At this virtual bench, the experimentalist undertakes a step-by-step activity just as would have been performed in the real-life scenario. 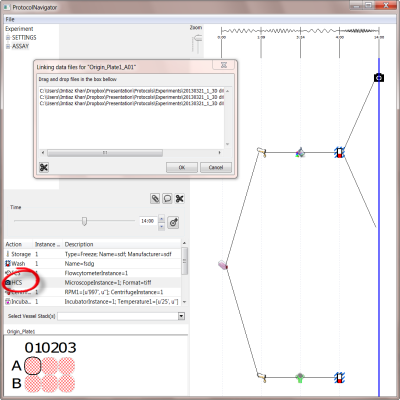 As each activity in the experiment is undertaken, the program automatically depicts the design or methodological map of the experiment on the canvas based on manipulation/measurement instance (what) is applied to the location of the vessel (where) at given time point (when). 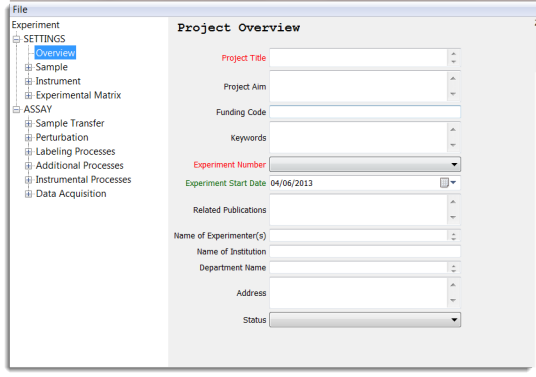 For measurements, users can link the experiment derived data (e.g. image data) within the map, which provides a visual contextualisation and provenance of the data. 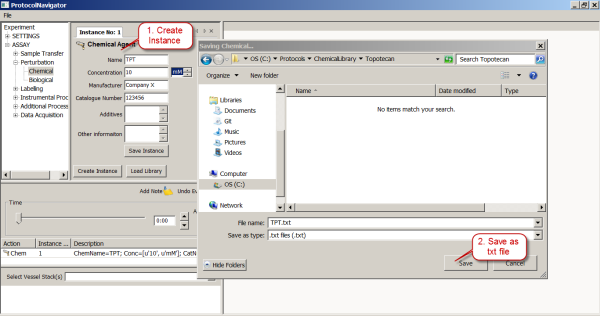 Users can publish the protocols at any time by clicking the Print under the file menu. The printing feature of ProtocolNavigator embraces the ethos advocated by current standardization initiatives - 'report in standard fashion', which is often perceive as burden to the experimentalist since it is double reporting and in a format that they are not familiar with. In ProtocolNavigator, not only this burden been relieved, but we also have adopted the Google Map ethos that provides a time-stamped sequential description of steps along with a localised visual representation of the location. We are further aiming to develop the capacity to extend this output format to any journal-specific functionality, where users can generate different format of material and method section from the same protocol. This will not only reduce the burden of creating multiple records of the same protocol, e.g., during execution (lab notebook), archiving (informal text document) and publication (formal text document), but also increase the possibility of coherent or standardized reporting of protocols. Efforts been taken to incorporate community approved vocabularies where possible to promote the establishment of standardized vocabularies and ontology. However, the user is able to change the filename to any desired nomenclature if deemed to be more suitable. 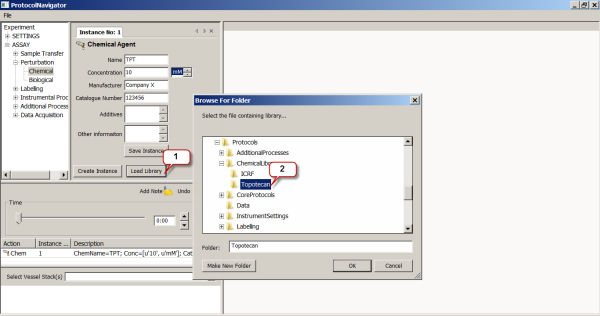 Note It is important to select and fill all three of the above fields, this creates the filename; otherwise the filename will default to 'new experiment' upon saving. Here the objective is to define the biological sample; in this case the cell line and its culture conditions to be used in the experiment. 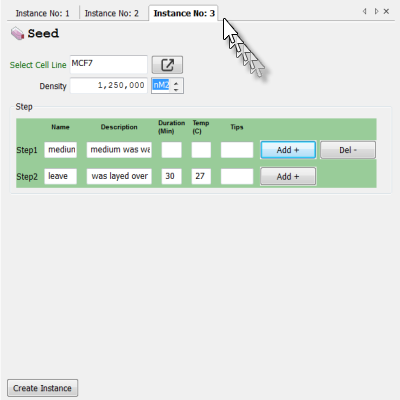 Multiple instances of the cell line can be created through the or button, this provides the user with the ability to define the origin of all the different cell types to be used. 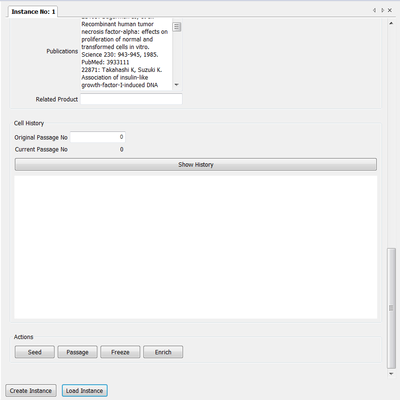 Each tab or instance represent a stock culture flask containing the sample which is defined by three sections - Administrative Information, Biological Information and Cell History. The first two sections contain the basic or static information that defines the cell line. Information at these two sections are in alignment with those available at the ATCC website. The last section describes the maintenance history of the cell line within a give laboratory. This section is dynamic and the degree of information can be changed according to the requirements of the users. There are four types actions that can be undertaken to create cell history: 1)Seed 2)Passage 3)Freeze and 4)Enrich. 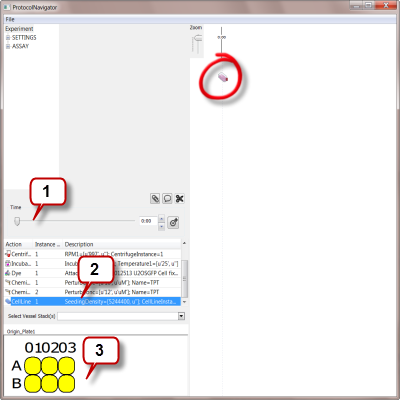 By clicking Seed button, a new window will popup, where the seeding action can be described. Users select the date, time, seeding density. Also if there are few processes involved during this seeding action it can be described in the stepwise fashion. Note The density unit is not effective to calculate density, it is for reference purpose only. By clicking Passage button, this window will popup, where passaging details can be described. Passage includes harvest and reseed (usually in different density) of cells Any process involved with passage can be described by the adding steps. Passage can be repeated as many times required. 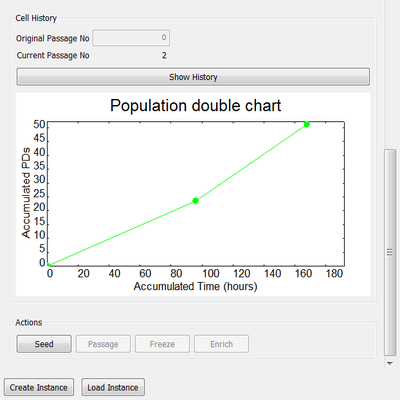 According to the seeding and passaging time, density parameters; population doubling (PD)time is automatically calculated and graphed. 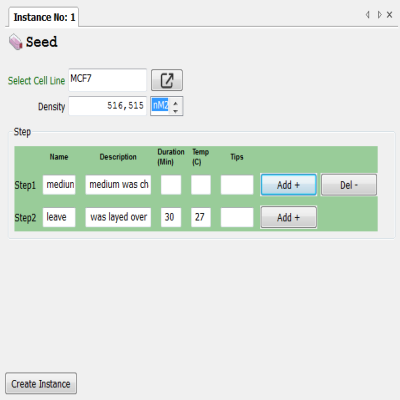 Details of the cell history so far can be read by clicking the Show History button. Through this action current cell line can be split into multiple flasks and freezed. Once freezed the biological clock stops, i.e. no further population doubling will occur irrespective of time elapsed. Through this action current cell line can be enriched through a process and then split into multiple flasks. The set-up and definition of a microscope is highly variable from laboratory-to-laboratory thus it is essential to define these bespoke systems accurately. 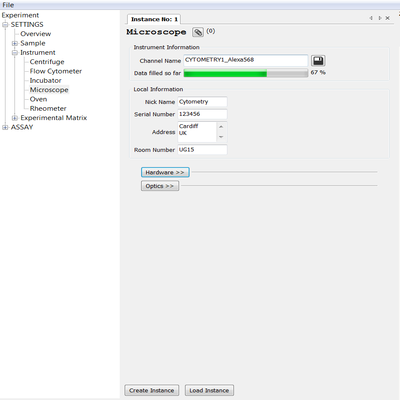 Each tab of a microscope instance represents the contrast mode and set-up for image collection this is termed a Channel setting. Therefore, if an experiment involves three channels (phase contrast, fluorescence 1 and fluorescence 2), three instances of the microscope depicting this must be created. The description and definition of the microscope has been divided into two sections - represented in two adjustable panes - Hardware and Optics. This section defines all the non-optical based components of the microscope (e.g. orientation, condenser, Stage and incubator). This section includes all the optical components that define the illumination and detection pathway; including light source, excitation filter, dichroic mirror, emission filter, lens, and detector. 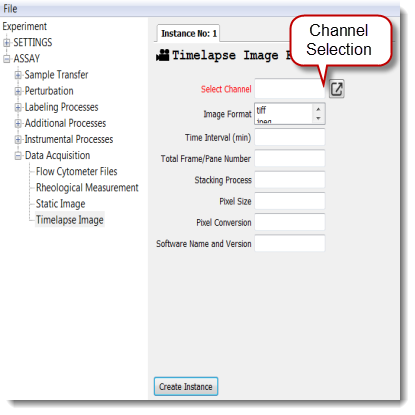 As stated previously each laboratory system is unique, and thus the Channel settings has a dense amount of information that defines the microscope; guided by the fields provided. It is recommended that users complete as many of the fields as possible. 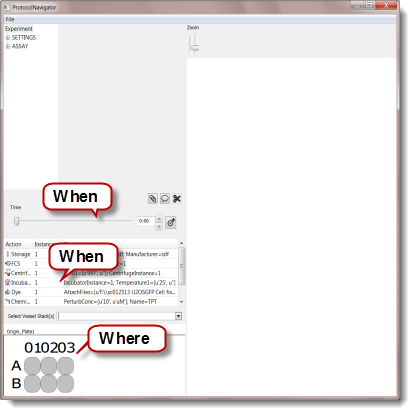 A parameter 'filler gauge' is provided to report how much data has been entered. Flow Cytometers are more rigidly defined from laboratory-to-laboratory. Therefore, it is essential not to assume the configuration of a system. The user therefore has the opportunity to define each set-up instance of the flow cytometers to be used. 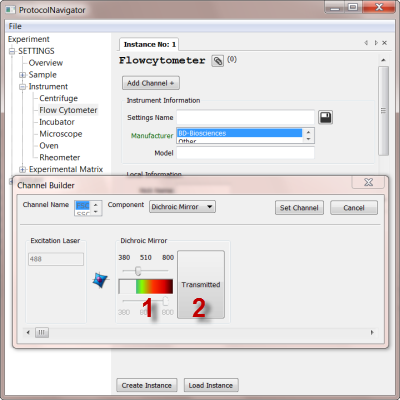 Essentially, each flow cytometer consists of different components (see the panel carousel below) which in combination make up the various channels. For the most popular flow cytometers, the components are fixed but for some flow cytometers (e.g. BD FACSVantageTM) customisation is essential. Note All the channel components can be added in any order according to the actual instrument, after setting the excitation laser wavelength. You can cancel the channel building process at anytime if a mistake is made. 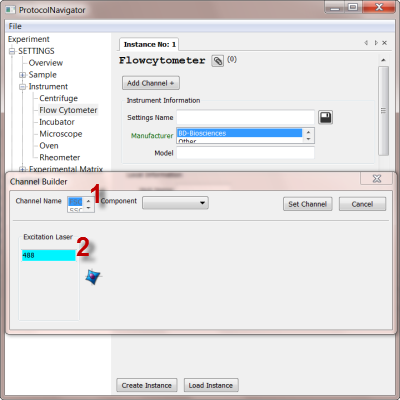 Channels can be easily deleted and rebuilt from scratch. The purpose is for users to understand at first principles the instrument configuration. Dye (to select Dye with the selected emission range). Click to Add Channel button to add or build a new channel. This will invoke a popup window called 'Channel Builder' where components of the channel are offered and can be added in modular fashion. (i) Select the channel name from the list. This will present the laser excitation field. (ii) Select the excitation laser wavelength (nm). 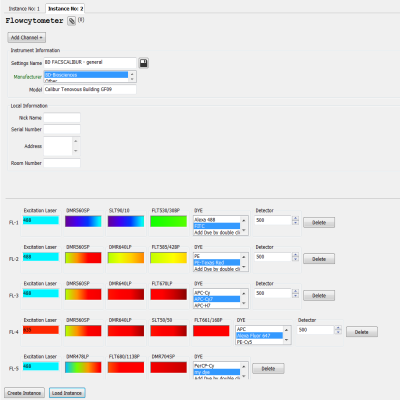 (i) The light spectrum can be selected by using the slider. To define the wavelength range use the top slider and the bottom slider. 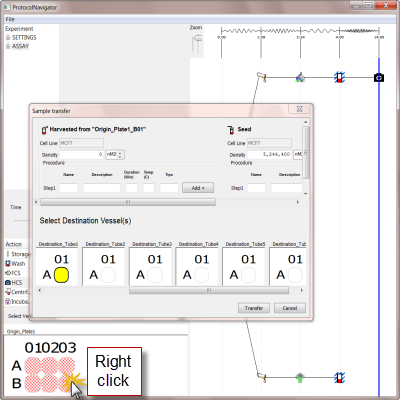 (ii) You can toggle between Reflect/Transmit modes by use of the toggle button. Caution Sliding one slider will deactivate the other, so be sure to confirm the longpass (LP) or shortpass (SP) configuration prior to using the slider. 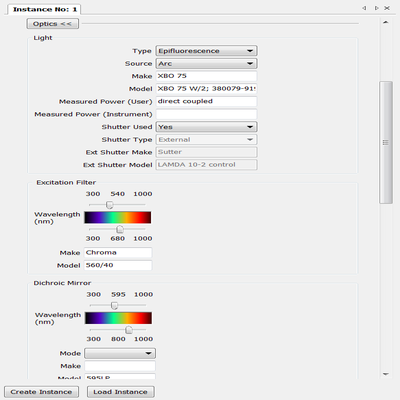 The filter wavelength range can be set by sliding the top and bottom sliders. Although this is not an optical component, it provides the functionality to unambiguously select the channel against the probe to be used. This provides real clarification for subsequent users of the protocol. The list on offer will depend on the emission spectrum of the previous component. If the probe in use is not present, you can add your own dye by double - clicking the 'Add Dye'. The PMT voltage can be adjusted by the dial. 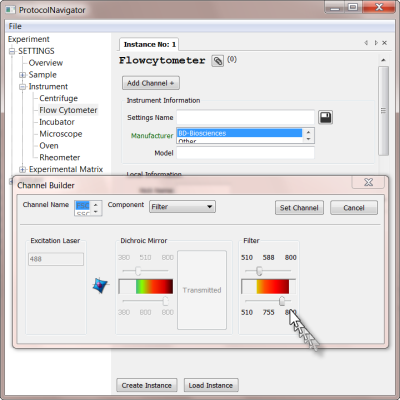 Once all components of the channel are defined and adjusted, click the Set Channel button to create the channel in the Flow Cytometer Instance Tab. Once this has been established, you can only modify the probe and voltage but the other components are now fixed. However, you can Delete the whole channel by the Delete button and rebuild the channel by clicking the Add Channel button. 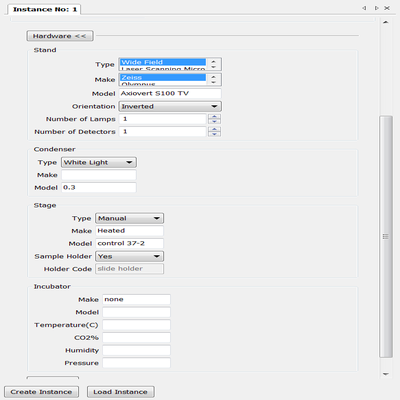 An example of BD FACSCalibur settings which can be modified according to users need by deleting appropriate channel. 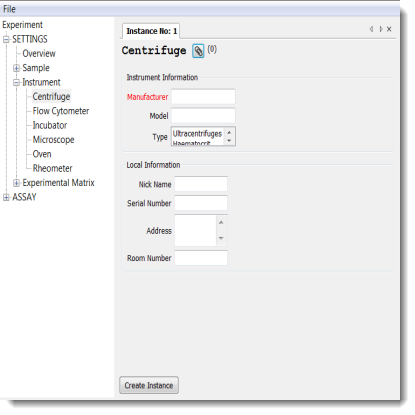 Here researchers defines centrifuge instrument. The defined instrument can be used for centrifugation, which is defined under the Instrumental Process. This requires dependency ? between the instrument and the instrumental process can be established in a modular fashion. Here researchers defines Incubator instrument. 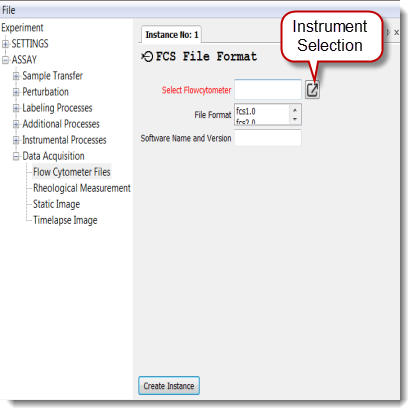 The defined instrument can be used for incubation, which is defined under the Instrumental Process. This requires dependency ? between the instrument and the instrumental process can be established in a modular fashion. Here researchers defines Oven instrument. The defined instrument can be used for drying, which is defined under the Instrumental Process. This requires dependency ? between the instrument and the instrumental process can be established in a modular fashion. Here researchers defines Rheometer instrument. The geometry of rheometer can be toggled between parallel and cone. 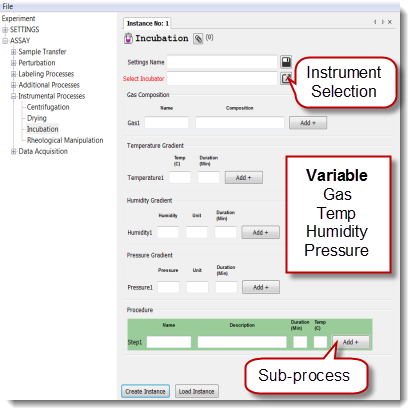 Multiple gas supply can be added to the instrument. 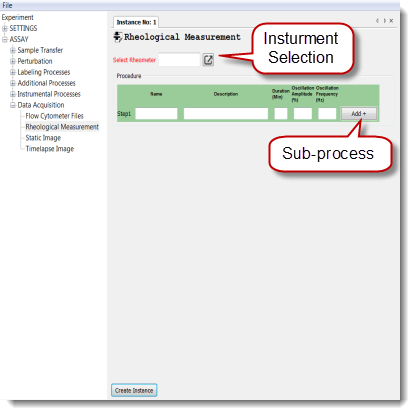 The defined instrument can be used for both manipulation and measurement, which are defined under the Instrumental Process and Data Acquisition respectively. This requires dependency ? between the instrument and the instrumental process/data acquisition can be established in a modular fashion. 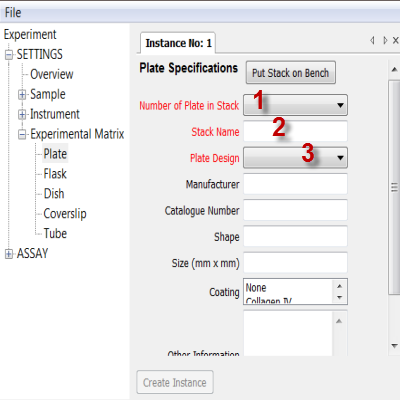 (1) Select the number of vessels (1-50) to be included in the stack; (2) Provide a recognizable name to the stack; (3) Select the design of the vessel (only applicable to a plate). Complete the other information as necessary. 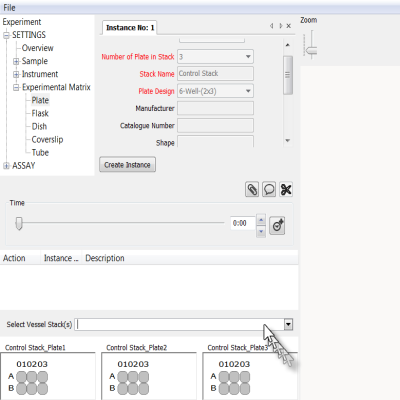 Once the configuration is complete, by clicking the Put Stack on Bench button, all the vessels in the stack will be available at the Bench. 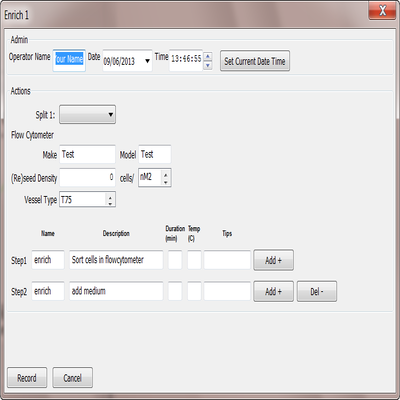 By selecting the Selecting Vessel Stack(s) option users can display and get access to vessels from different stacks. Depending on the selection, different stacks can be viewed or accessed individually or jointly. Note ProtocolNavigator is really designed to work with upto 24-well plates, beyond this the performance of the tool is not satisfactory. We aim to address this issue in future versions at the same time as making the matrix flexibility completely bespoke and user-defined (NxM). Seeding refers to the action of transferring cells from the stock culture flask to different destination wells, coverslips, flasks or tubes. Or it refers to the reseeding from one active vessel to another, and will usually be applied in the middle of an experiment and will also require a harvesting step first. Therefore the seeding element is linked or has an informatics dependency ? on the original stock culture (Cell Line) element defined within the ASSAY category. 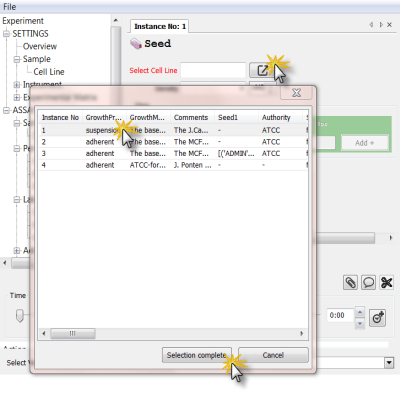 Seeding linked with harvest is automatically created but can be modified later. To capture the granularity of seeding action, sub-process ? of this action can be added in a modular fashion. 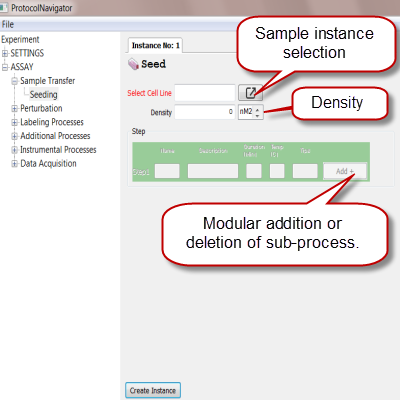 1)Select a cell line (sample) 2)change seeding density 3) define sub-process as required. 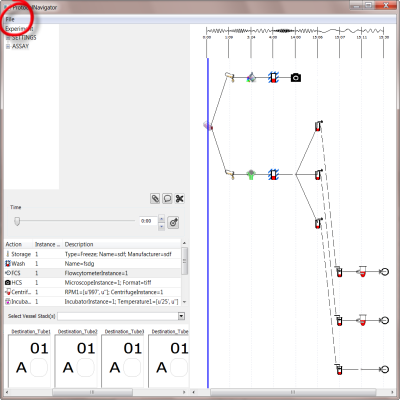 From the dialogue select the appropriate cell line, this is represented by an originating stock flask. 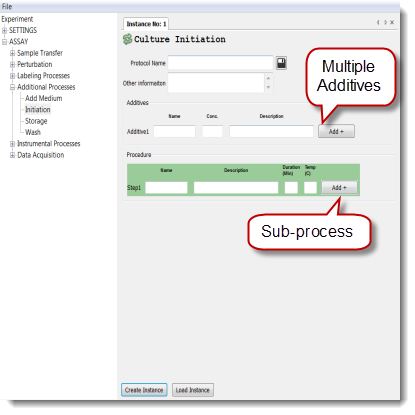 Multiple steps within the sub-process can be added/deleted in a modular fashion. As in a real tissue culture laboratory multiple instances of seeding instances can be created, which then in turn will be available at the Bench to be applied on different assay vessels. Each instance of 'chemical' represents an individual drug/agent and also can represent different concentration of the same agent. 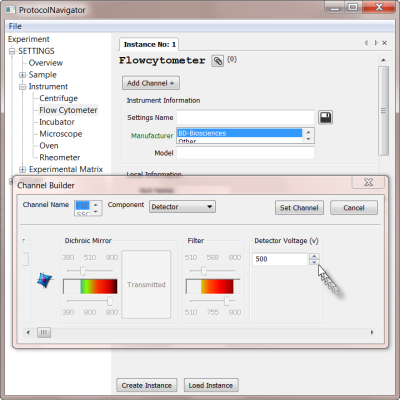 In ProtocolNavigator, users create individual instances or upload a chemical library ?. Once created each instances are available in the Bench for manipulation. Note Important if the desired concentration unit is not available in the option list, then by clicking to Other, a new unit can be created. A biological perturbation refers to a manipulation by the addition of constructs for knockdown or transfection for knocking. 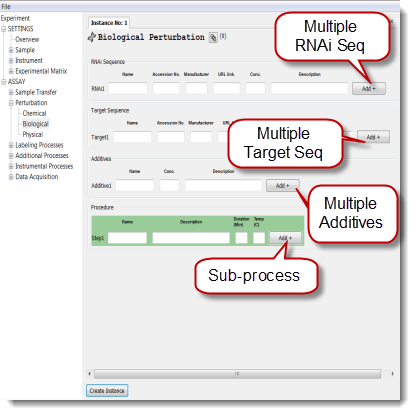 All components (RNAi, Target Sequence, Additives and Sub-Process) of biological perturbation can be added/deleted in a modular fashion. Note Unlike the chemical perturbation biological perturbation library can not be created or loaded. A Physical perturbation refers to a manipulation through physical means by using different materials. All components (Materials and Sub-Process) of physical perturbation can be added/deleted in a modular fashion. Note Unlike the chemical perturbation a physical manipulation library can not be created or loaded. 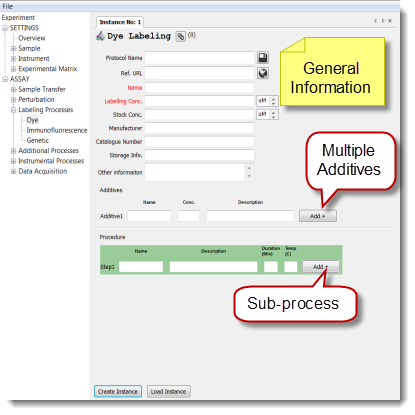 Dye labeling - Sample labeling with a fluorescent molecule or chromatic. 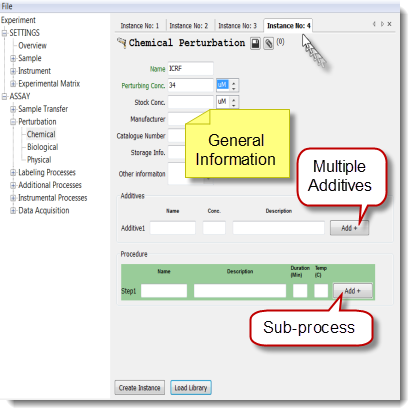 Each instance has three parts - general information, additives and sub-process ?. Labeling via an immunofluorescence method includes use of antibodies. 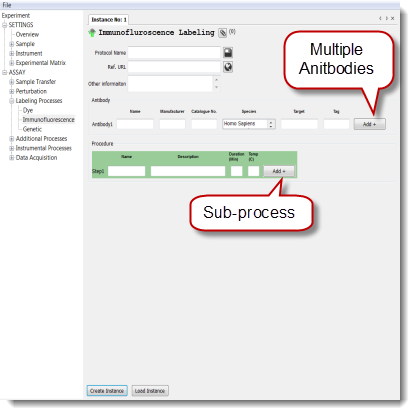 Here antibodies and the sub-process ? of applying can be documented in a modular fashion. Labeling with a genetic reporter includes use of Primers. Here primers and the sub-process ? of applying can be documented in a modular fashion. Centrifugation is a process of separating mixtures, pelleting samples by centrifugal force. This process is dependent ? 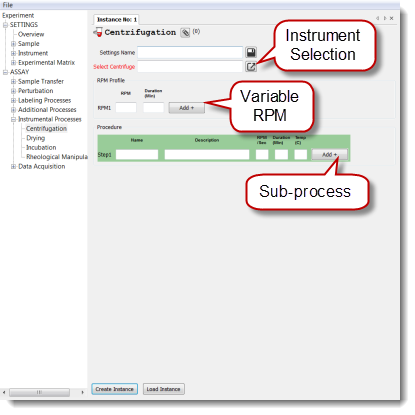 on centrifuge instrument and the process can be customized based on variable rmp of the instrument and steps associated with it. Drying is a process for the removal of water or another liquid content from the sample using heat. This process is dependent ? on oven instrument and the process can be customized based on variable gas concentration, temperature, humidity, pressure and steps associated with it. Incubation is a process of providing controlled environmental conditions to a biological sample. This process is dependent ? on incubator instrument and the process can be customized based on variable gas concentration, temperature, humidity, pressure and steps associated with it. Rheological manipulation is a process of providing controlled pressure on biological sample. This process is dependent ? on rheometer instrument and the process can be customized based on variable gel composition, gel profile and steps associated with it. Adding medium or additives is a process where researchers are able to define a mixture of medium/additives and then add it to the sample. 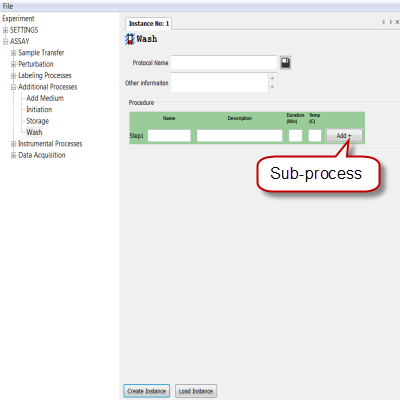 Step-by-step sub-process ?, is included within this element to describe the process in-details. Washing is a process where researchers are able to define the process of changing the reagent environment of the sample. 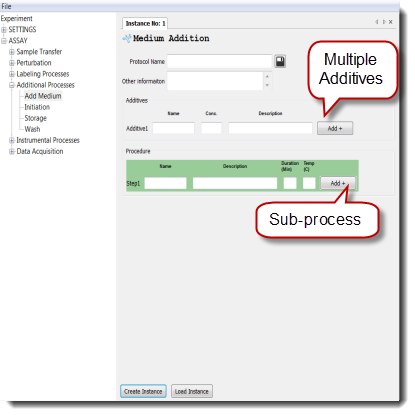 Step-by-step sub-process ?, is included within this element to describe the process in-details. Initiation is a cell based assay specific process where researchers are able to define the process of initiating a cell culture by adding different additives in a step-by-step fashion. 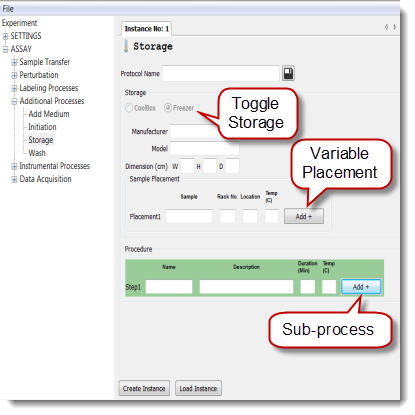 Step-by-step sub-process ?, is included within this element to describe the process in-details. Storage is a process where researchers are able to describe how the samples were preserved. Here samples can be stored either in coolbox or in freeze, which needs to be selected. 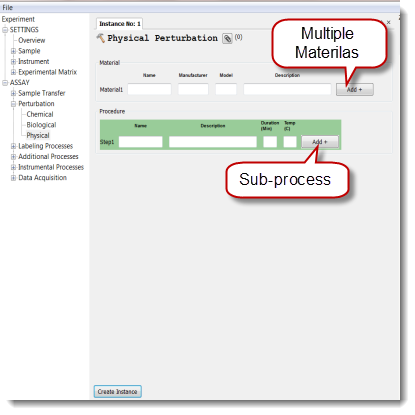 Step-by-step sub-process ?, is included within this element to describe the process in-details. Logically storage requires freeze and therefore should be under Instrumental Process, but since non-instrumental equipment like cool box or room can be used for storage, it is not included under the Instrument Process category. This element defines the timelapse image format, by which the measurements or data acquisition was done. This element has dependency ? 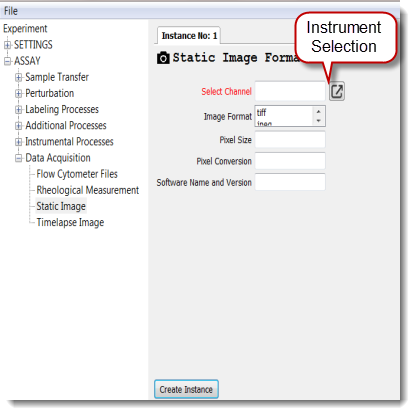 on the microscope or channel settings defined under the instrument section. This element defines the static image format, by which the measurements or data acquisition was done. The element has dependency ? on the microscope settings defined previously under the instrument section. 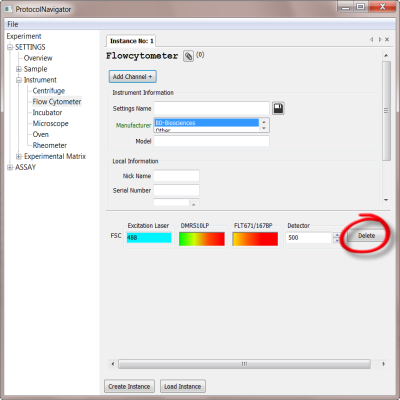 This element defines the file format for flow cytometry measurements. This element has dependency ? 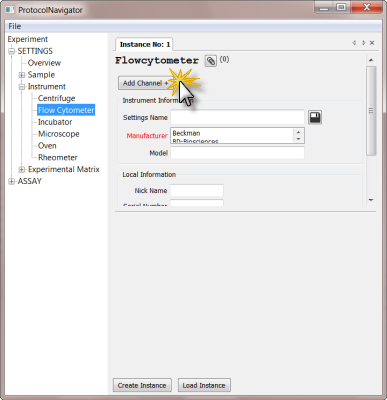 on the flow cytometer settings defined under the instrument section. Rehometer defined under the instrument section can be used both for manipulation and measurement purpose. This element defines the measurement part where it has dependency ? on the Rheometer and requires step-by-step description of the measurement process. 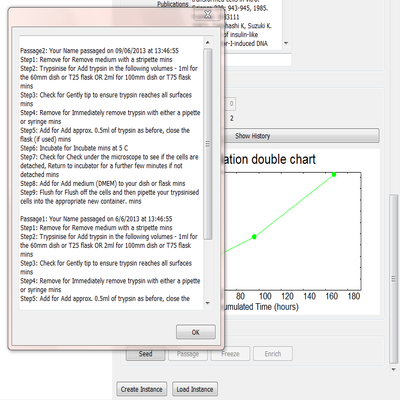 The timeline is selected and set (when), followed by the selection of an instance from the Bench (what). Finally the instance is associated to an experimental vessel in the experimental matrix (where). Here at time point 0:00 hrs (when), cells (what) were seeded from the stock flask into a six-well plates (where) shown with yellow colour. 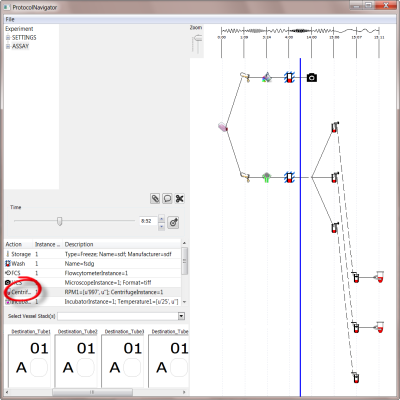 As seeding was done a flask icon is drawn within the canvas under the timeline. Here at a later timepoint (1.09 hrs) two concentrations of the drug topotecan (TPT) were added, 10uM to the upper row (Well A01-A03) and 1uM to lower row (Well B01-B03). Variation of instances cause bifurcation of the tracks with two drug icons on the map. Then at timepoint 3:24 hrs the plate was exposed to two different labeling processes. Upper row (Well A01-A03) to labeling with chemical dye, while bottom row (Well B01-B03) with immunofluorescence. At 4:00 hrs all wells were washed to get rid of the unbound label. Two of the three tubes where cells were transferred were spined at 15:11 hrs. At 15:30 hrs, flow cytometry data were collected from all three tubes. Users can save and exit at any time of the documentation by choosing the save submenu from the file menu. 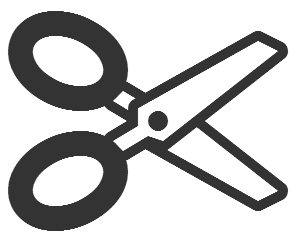 Saved protocols can be opened again from further modifications. 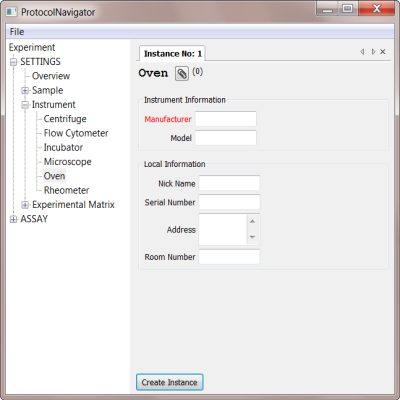 Similar to a real wet-laboratory, new materials on the shelf, new vessels on the workbench and extension of the time can be executed during the course of the experiment; and most importantly users can undo/delete actions by selecting the action icon on the map and then click the undo button on the Bench panel. This feature enables the user to adapt, correct or evolve their protocol. The Harvest-Seed process represents a series of actions undertaken that enables manipulation of the tissue culture process; in ProtocolNavigator terms the cells are transferred from one physical location to another. It is important that details of the transfer specification such as cell density adjustment, changes in media are fully annotated with the action of cell transfer. The challenge has been to model such complex and variable actions through the Bench panel, tracking the physical movement of cells from place to another is not simple and we acknowledge more improvements are required. Critical Point - A textual description to flag other readers about a critical element associated with the action. 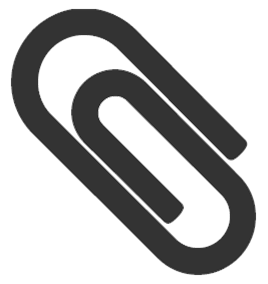 URL - A link with a relevant website. Should users need to link multiple URLs, multiple instance of notes are created. Once note documentation is complete. Clicking OK button will show the icon on top of the timeline. For modifications click on the icon this will invoke the same dialogue, but note type can not be changed during modification. However, multiple notes can be added at same time point. Some of the elements within the ASSAY category has a 'dependency' on certain elements of the SETTINGS category. These dependency are essential to properly define these ASSAY elements. 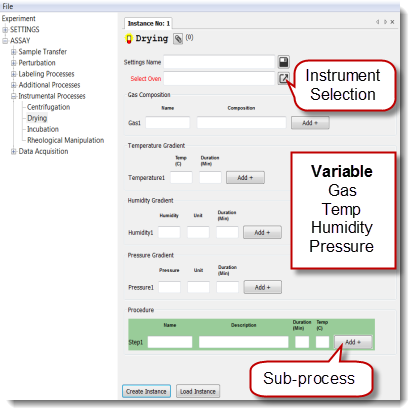 For example, to execute elements under Instrument Process and Data Acquisition are dependent on the corresponding Instrument element under the SETTINGS category. these are easily understood once the user become familiar to the tool.The following table shows dependency links. 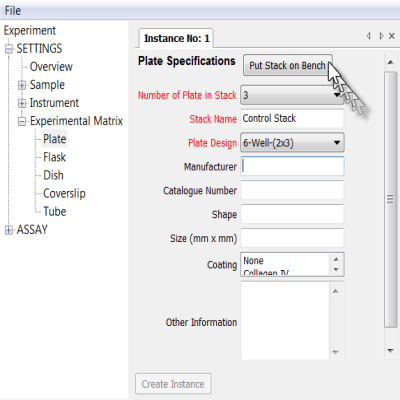 How to establish dependency: Click to the Select button situated at the top row of respective ASSAY element, this will open a dialog showing appropriate SETTING element, with all available instances from which users can select single element. 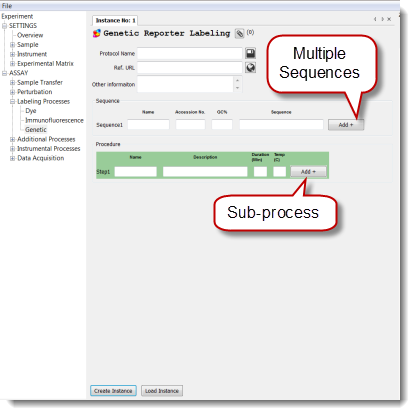 Multiplicity: Same SETTING element can be used to create multiple instances of ASSAY element, for example, from the single Cell Line element, multiple Seeding element can be created. First can save individual instance by clicking Save Settings button. 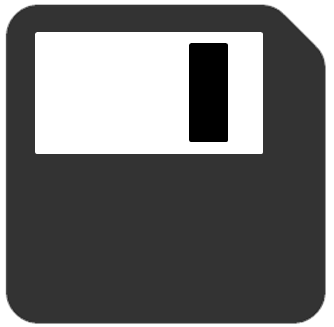 Second save individual instance in text file and copy and replace components as required. Save the copied file in different name to create variations. 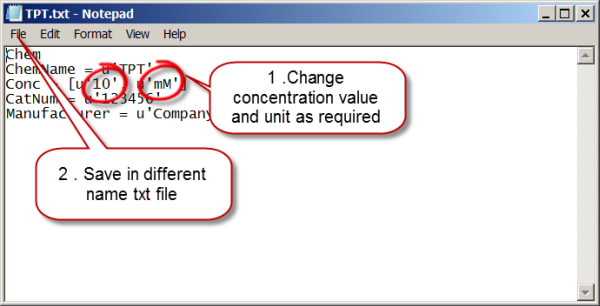 Manually change the concentration and then save the file in different name.Note A library is represented by a folder, so all files belonging to same library must be saved in the same folder. By clicking Load Library button users can upload all the files of that folder/library. In biological assays, some processes such as labeling, centrifugation, seeding etc. has a limited number of steps that are part of the whole process. 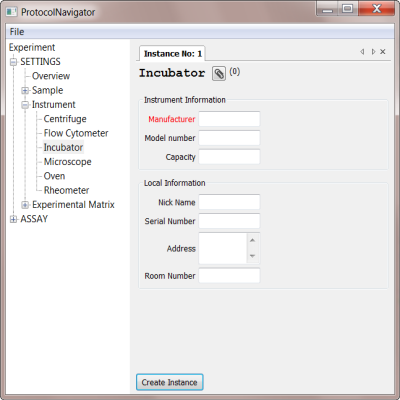 However steps involved in these processes are commonly invariant and therefore in ProtocolNavigator, these steps are considered as sub-processes of the main process. Even though many of these sub-processes have time duration, they are not visible within the time line, rather the whole process is symbolized by an icon within the map at a particular time point. Save settings can be done at any point of documentation by clicking the Save Settings button. It is saved as a text file, usually the name of the file is taken from the name field. By clicking Load Instance button you will be enable to re-use previously saved settings. This will open a file dialog through which you can open the appropriate file for the instrument. Once uploaded, this will create a new tab/instance for the setting which can be modified as required. The modified settings can also be saved for later re-use.